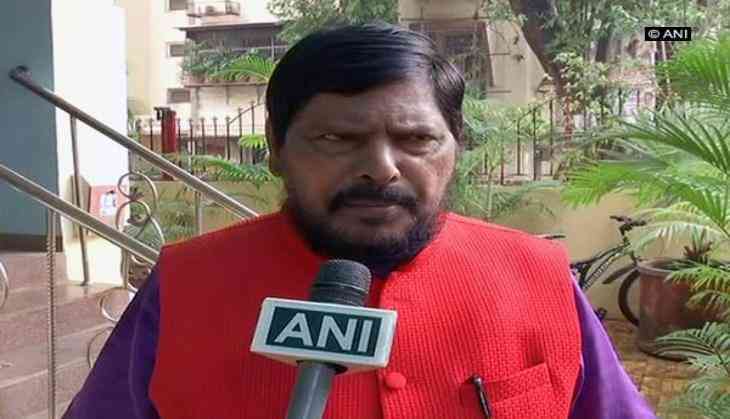 Union Minister Ramdas Athawale demanded a ministerial berth in the Maharashtra government for his Republican Party of India (RPI). Speaking to ANI, Athawale said he would put forth the matter for discussion before Maharashtra Chief Minister Devendra Fadnavis. "We demand that a minister post be given to Republican Party of India (RPI) in the Maharashtra government. We have always stood by the Bharatiya Janata Party (BJP), even when the Shiv Sena decided to go alone for the 2019 Lok Sabha polls. We had put forth this demand earlier, and will bring it up again before Fadnavis," he said. The Shiv Sena-BJP ties have been strained in the recent past, following the former's decision to contest the 2019 Lok Sabha polls independently. Athawale, along with other ministers, had suggested that the two parties hold talks to try and keep the alliance intact. However, the Shiv Sena has been unresponsive to the same. Last week, Shiv Sena Chief Uddhav Thackeray had accused its alliance partner of doing injustice with the nation at various fronts and stated that the party would opt out of the National Democratic Alliance (NDA). Shiv Sena, in its mouthpiece, Saamna, also claimed that it would win the next Maharashtra Assembly Elections on its own and will the role of a kingmaker in the 2019 general elections.